Under Rule 581, suppression of the evidence is usually included in your Omnibus Motion. A motion to suppress is filed when the Defendant alleges the evidence has been obtained in violation of the person’s constitutional rights. In other words, the Police invade a household, gather evidence and do not have a search warrant. This is the most common reason to file a suppression motion. Other reasons include contraband, such as drugs, taken without probable cause or without a search warrant. These types of motions shall state specifically and with particularity the evidence they are seeking to suppress, the grounds for suppression and the facts and events that support the suppression. After a Motion to Suppress is filed, the Court shall, prior to the trial, afford the Commonwealth a reasonable opportunity for investigation and then time is granted for a hearing, ordinarily held in open Court. The hearing shall be outside the presence of any jury. Most importantly the Commonwealth shall have the burden of going forward with evidence and establishing that the challenged evidence was not in violation of the Defendant’s constitutional rights. 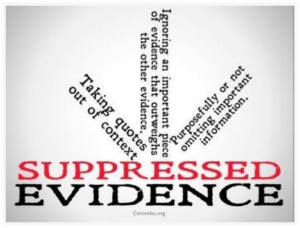 If the Court determines the evidence should not be suppressed, such determination shall be final and binding and the case will proceed to trial. This now becomes an issue for appeal if found guilty at trial.